This translation presents the hymns of Kabir from the Adi Granth (the holy book of the Sikhs), which has been neglected because it is written in Gurmukhi script rather than Devanagari. The introduction contextualizes these songs and proceeds to examine their construction of meaning. 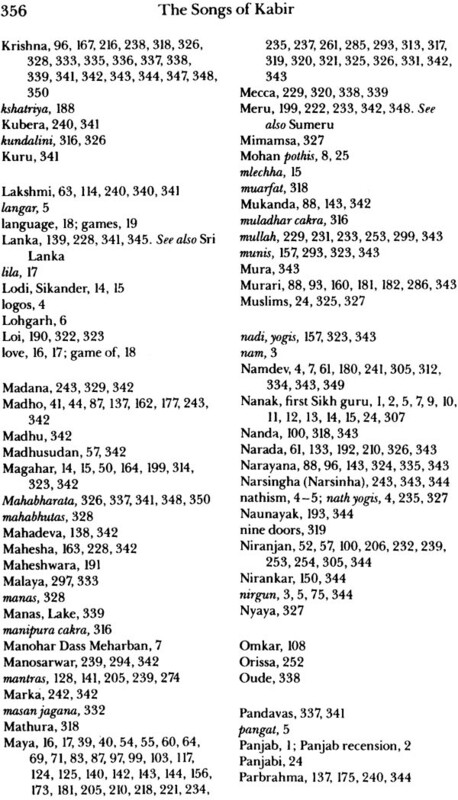 Most songs have explanatory notes, and there is a Glossary of names and terms that appear in Kabir’s work. “This book makes available for the first time a complete English translation of the entire corpus of the great poet – saint Kabir as contained in the Adi Granth of the Sikhs. For students of Indian religion, especially of the devotional bhakti movement, the medieval Sants and the roots of Sikh religion, the absence of such a work has been keenly felt. 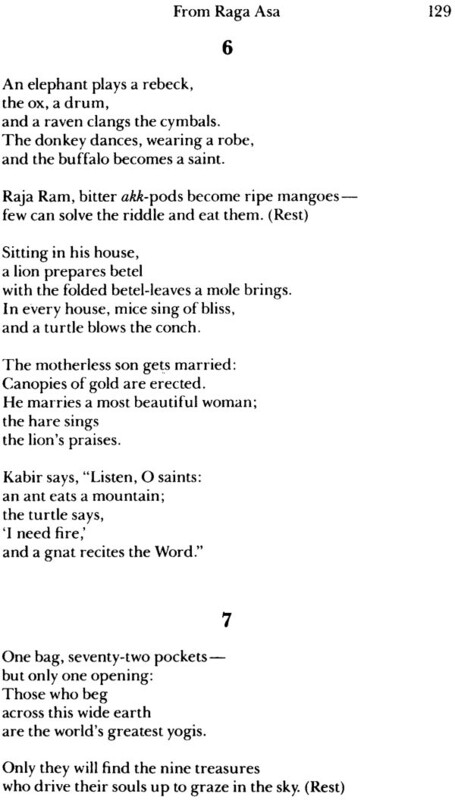 For those interested in Kabir, it provides for the as yet little studied third recension of the poet’s work the kind of basic text in translation available for the first, the Bijak, and the second, the Granthavali. “This is an extremely important topic in the field of Indian religion. The role of the medieval Sants in the devotional reformation of Hinduism, the influence of Kabir as the greatest Sant figure, and the emergence of Sikhism out of the matrix of Sant devotionalism are all important questions which this work of translation will aid in examining.” – Dr. Karine Schomer, Research Associate, University of California, Berkeley Center for South Asia Studies; Dean of the School of Humanities and Social Science, Golden Gate University. Texts canonized as scripture address an audience united by shared religious beliefs. Text and audience presume a common ground, namely, a transcendent reality of God, in whom truth is fully vested. But what happens to such texts in our post – Nietzschean world? What do we do with scriptures when most to us do not believe in their Author? 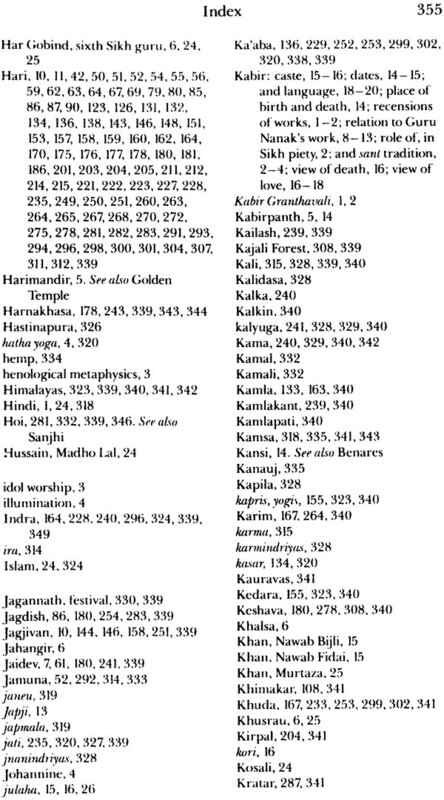 For example, the ideological content of these songs of Kabir is generally to show that God is ultimate truth. Already we may not expect to respond to their primary purpose. Then why read them? Is there anything left in the scriptures of the world once belief is removed? On one level what remains is scriptura, which is liminal and errant; on another, we are left with texts that keep us unsure by raising questions that perpetually escape easy answers. When Nietzsche announced the death of God, he also reminded us that this event, this message, is still on its way; it has still not reached most people. Perhaps these scriptures, these songs, are also still wandering; they force us to come to terms with the Nietzschean event, and keep us from taking the easy road of merely taking about recreating a past long vanished. We live between two kinds of death (God’s and out own). All scriptures deny both. And yet some trace of the event perhaps remains which will reach our ears – for what we read is also what we hear. I raise these questions not to answer them but because they ultimately became my lex scripta as I translated these songs. These songs/questions only lead us deeper into an ever- more complex labyrinth, which contains not a still, locatable center, but at its heart yet another maze. In this wandering journey, we are part of many texts, many books, many scriptures that we (as individuals and institutions) co – author. This text has no boundaries; it is and will be ever – Protean. Where Kabir signed once, “I” too sign and give my own authority, fully aware of my marginality and liminality – for my language here commands no “correct” or final meaning. In these songs, meanings are always transitional. 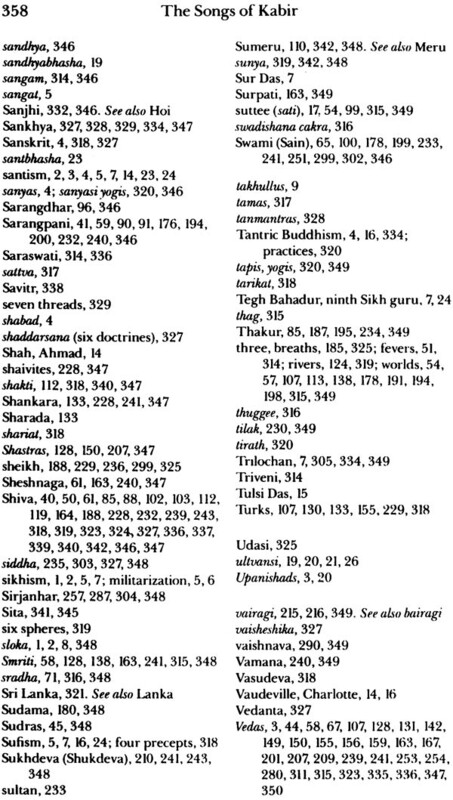 The songs of Kabir translated here are part of Sikh scripture, and as such they hold a unique position in the Kabir canon. The Sikh community was founded in the fifteenth century, in the Punjab, by Guru Nanak. 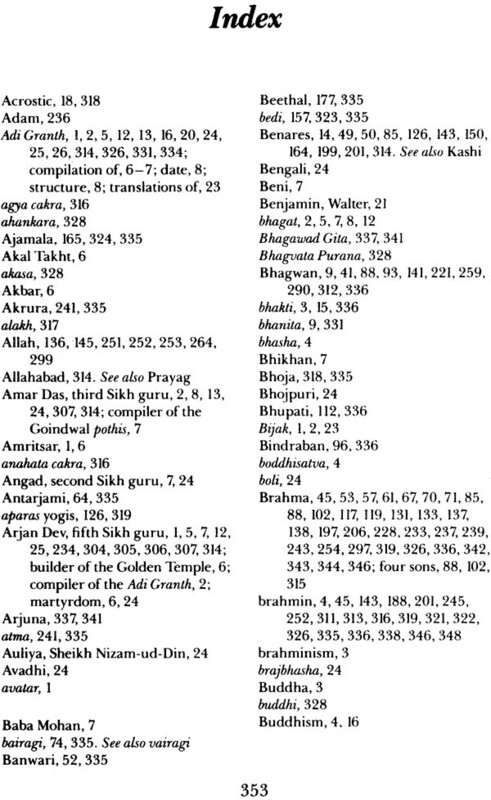 Consequently, these songs expound not only Kabir’s own concepts, but also Sikh piety itself; they come down to us unchanged from at least 1604/5, when the fifth guru, Arjan Dev, codified all the songs of previous gurus and saints into one book, the Adi Granth, written in the Gurmukhi script. Kabir’s songs in this recension are in the eastern dialect of Hindi, with some admixture of Panjabi. They are filled with a particular freshness of image, style, and expression in their approach to the ancient problem of spirituality – for they question the very nature of spirituality and religiousity. This questioning speaks to our own age quite strongly, where distrust of systems is prevalent. We read these songs not for instruction or pleasure, but because they lead us to thinking; and the telos of thinking is not the arrival at an answer, but the provoking of thought which permits us to examine our role in all that exists. These songs set us on our way toward this examination. The entire work of Kabir has come down to us in three major recensions: Eastern (the Bijak), Rajasthani (Kabir Granthavali), and from the Panjab (the Adi Granth). The first two have been thoroughly studied, edited, and translated, but first two have been thoroughly studied, edited, and translated, but the third has not really been dealt with on its own, although various translations and studies of the Adi Granth exist. 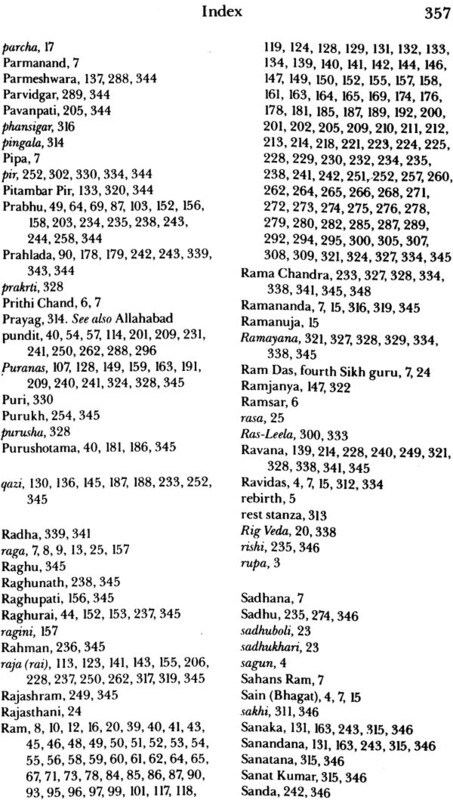 These recensions differ from one another, but on the whole the Rajasthani recension has more hymns and slokas in common with the Adi Granth. Even a brief comparison with these other recensions permits us to ask the interesting question: Why were certain songs of Kabir chosen for inclusion in the Adi Granth and not others? Any attempt to answer this question necessarily leads us into the very heart of Sikh piety, with its close link with medieval Northern Indian religious traditions. It is only in recent times that standard editions of the Bijak and the Kabir Granthavali have been established. 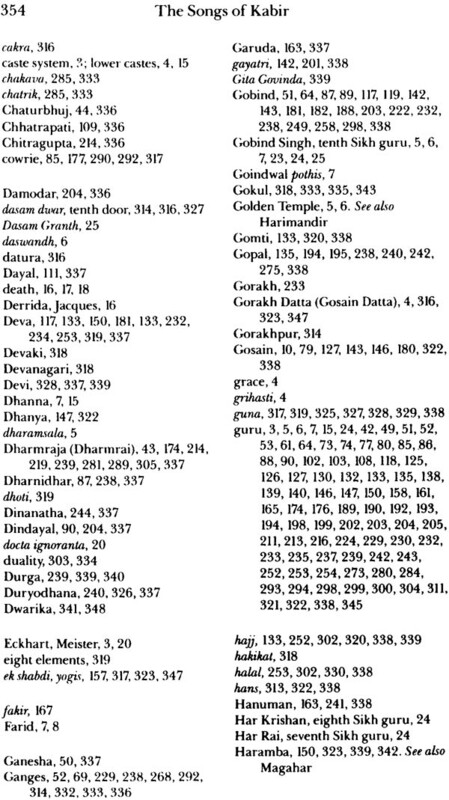 The Panjab recension differs from these two in that it is pre – edited: It is part of an anthology (the Adi Granth) of mystical songs by various bhagats (“Saints”) and Sikh gurus, compiled by Guru Arjan Dev in 1604. This suggests that these songs have been carefully selected for their affirmation of Sikh doctrine; those that did not fit in were simply excluded. We can find evidence for this theologically manipulative editing in three forms. 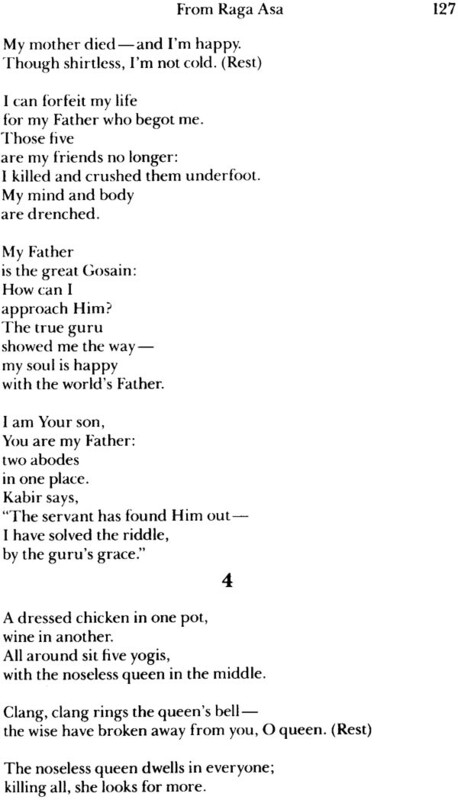 First of all we have the appending of verses by the editor, Guru Arjan Dev himself, but under the name of Kabir, to a song by Kabir (Gauri, 14). 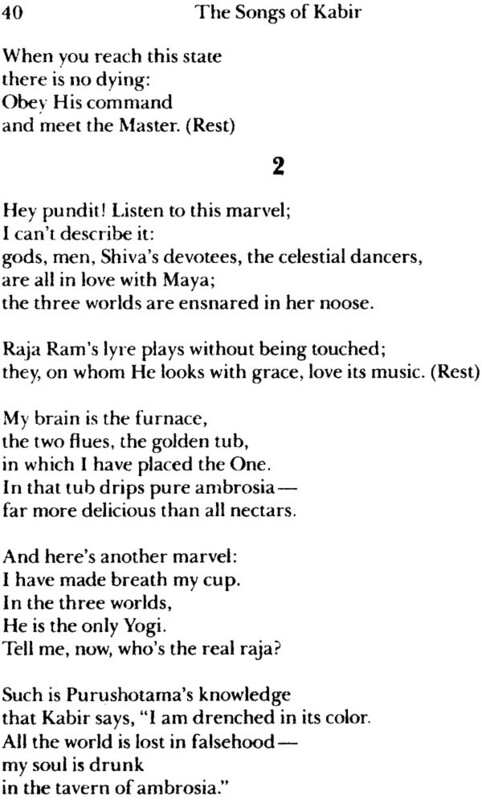 Secondly, there is the inclusion of whole poems by the editor into the Songs of Kabir (Bhairo 12; Slokas 209 – 211, 214, 221). 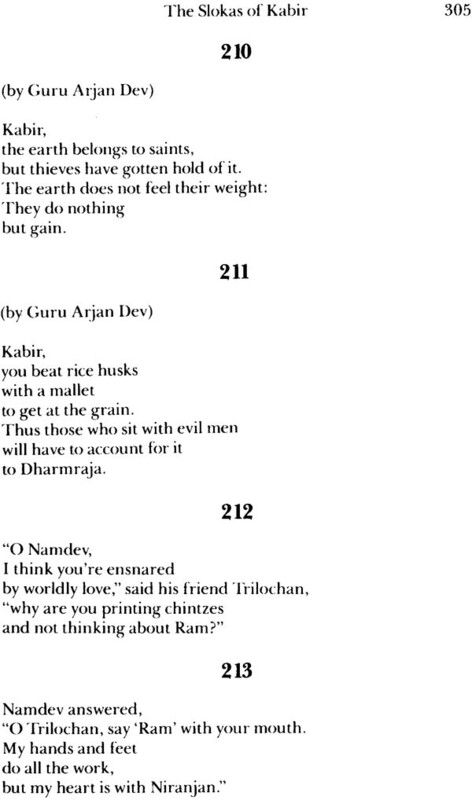 Lastly, a sloka by the third Sikh guru, Amar Das, has been placed among Kabir’s Slokas (no. 220). These examples are in fact instances of affirmation of Kabir’s work: There is agreement, endorsement, and, if need be, clarification. The question that naturally arises is, why not leave these instances out? Their importance lies in the fact that Sikh tradition does not differentiate between Kabir’s won work and the emendations, additions, and interpolations by the two gurus. A particular sense of authorship is at play here. The Sikh gurus all took the pseudonym “Nanak,” the personal name of their first guru; this was to demonstrate continuity – the “spirit” of Nanak was embodied in all of them. The signature “Nanak” authorized a poetic utterance. When Guru Arjan Dev and Guru Amar Das approach Kabir’s work, they freely move within it also in order to highlight this continuity – what Kabir said is what the two gurus say – the tradition, the, the utterance, begun by Kabir is now being completed. 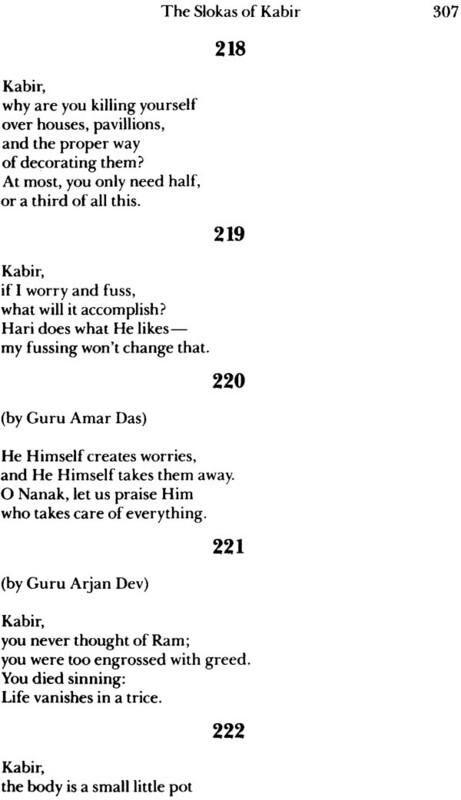 Since these translations are not only of Kabir’s songs, but also about the songs of Kabir within Sikh piety, I have chosen to retain these interpolations and additions as they have come down to us in the Adi Granth. But in order to fully realize the nature of this affirmation, let us briefly indicate the context of Kabir’s own doctrinal position. It has long been recognized that Kabir is to be understood within the sant (“mendicant”) tradition of northern Indian. Of course, we must first of all clarify this tradition, since the sants were never a unified group. Indian religious sentiment has always harbored two attitudes: One that cherishes the Vedas and the Upanishads as the only true sources of spiritual and divine wisdom, and the other that firmly denies this scriptural authority in favor of enlightenment gained through personal experience of the Supreme. The Buddha is the best example of the latter; and it is in that tradition that we can locate the sants. Thus tradition should not be understood as received precepts and authority, but rather as an attitude that seeks to either accept or deny religious systematization. On the whole, the sants sough to deny the accepted notions of the holy – they rejected the Vedas, the Upanishads, idol – worship, ritual, Brahminism, and hence also the caste system; in brief, they denied external, visible manifestations themselves. What they advocated was internal – inexpressible, unworded inner love and devotion (bhakti) for a Godhead that was itself internal, non – incarnated, without attributes (nirgun). The divine was blended in all of creation; it was the primal essence diluted in all things. The loving devotee could fathom the unfathomable only by realizing this presence: The divine was as close as oneself – esseest dues. In effect, devotion was to be centered upon the God beyond God, whose abode was silence, who was not the many, perhaps in the same sense as Neoplatonic henological metaphysics, which defined God as the ground of all things. Bhakti meant meditating upon the “Name” (nam) and not the form (rupa), at first aided by a human guru (himself already merged with God), later by oneself. The Name itself freed one form all names and led one to the Supreme; it was the nomen omninominabile et nomen innomibabile that Meister Eckhart struggled with. Salvation required braking the cycle of transmigration to gather the separate fragment of the divine back into the Godhead, when the individual soul itself became part of God. And it was love and devotion alone which united the two, like long – expectant lovers. But if this opportunity for union was neglected and missed, then the individual again wandered, never complete – like lovers never to be united.